My reasons for loving the Danieli are rather ridiculous but, as every little girl who watches a rom-com will know, sometimes you just have to stay somewhere you have seen in the movies. My movie was a rather silly Robert Downey Jr film called Only You that had the poor guy chasing a girl around Italy. One of the places they pop into is the Danieli and, from a young age that majestic lobby, those old fashioned fringed keys and the piano bar made me wish I could stay there. The hotel is an institution in Venice and is referred to in more movies and books than Only You, and today, the Danieli Hotel remains one of the more starry places to stay in Venice. For unbridled luxury, this prestigious 225 room hotel is made up of three palazzi, the oldest dating back to the 14th Century. Views across the lagoon, a two-minute walk to St Mark’s Square and close proximity to the Doge’s Palace and the Bridge of Sighs make it perfectly positioned for guests who want to stay in the thick of it. 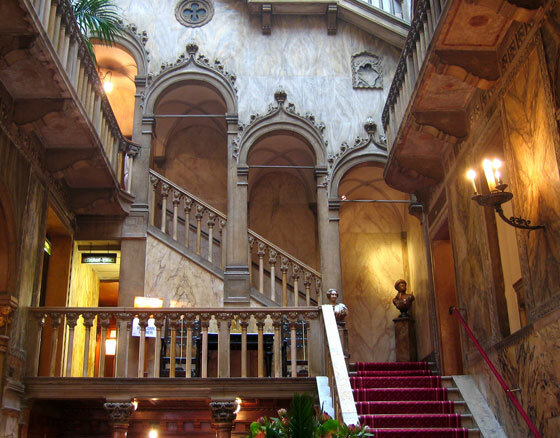 One of the best features of the hotel is the ornate lobby, complete with Murano glass chandeliers, opulent rugs and marble as well as antique furniture and a brilliant pianist who sets the scene for cocktail hour in the bar. Other highlights include the rooftop Restaurant Terrazza Danieli, once the place where Venetian nobles would watch the merchant ships coming and going, now favoured by the well-heeled the world over who come for fine dining, Italian wine, cocktails and incredible views, day or night. So, despite having high expectations, waking through the turning doors here wasn’t a disappointment when I finally got to go – and you won’t be sorry either. And, if you haven’t seen Only You – rent it before you go!